Meet Kyle Hagerty, an urban farmer in Sacramento. Kyle grows his crops and then gives them away for free at his farm stand located in front of his house! We think that’s pretty amazing! 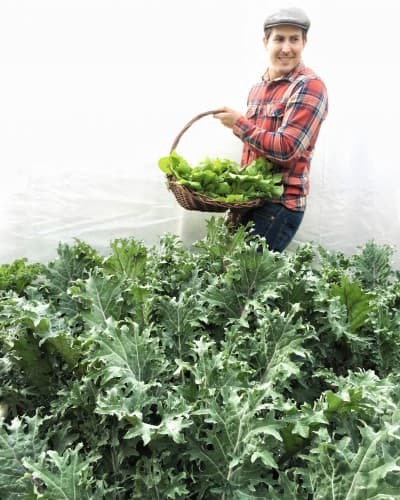 Learn more about Kyle and what he’s up to at East Sac Farms. Kyle: Well right now we’re kind of in a transitional phase from our winter crops to our spring and summer crops. I’m managing and extending the season of some of the cool weather crops by adding some shade cloths. I added some over our chard. Today I am also working on building our new trellis system for our tomatoes as well as working with our compost and improving and revitalizing the soil to get it ready for planting of the summer’s crop. And also caring for all of the new veggie starts for our spring and summer garden. Kyle: I’d say my favorite thing is having the freedom to grow or try and grow whatever I want and knowing the food that I’m producing is completely safe and grown sustainably. I also just love being able to be outside and working with the earth makes me feel happy and alive. Kyle: Well, we actually have a farm stand, a neighborhood farm stand where every Tuesday we give away all of our produce that we grow here and we just accept donations. We don’t sell anything, we either consume it or preserve it ourselves or give it away at our farm stand. It’s all donations only. It’s everything from fruits and vegetables to plants, vegetable starts like tomato starts and raspberry plants. Right now we are doing it every other week. It’s an urban farm so everything we grow is in our backyard. We harvest it and then wheel it out to the front yard where our farm cart is. The most fun part of it is we invite people to the backyard to see where it all grows. There’s another way I’d say we give back, we also do Farmstead Suppers, which is the farm to fork dinner series we started last year. We host the dinner here and we use produce from our farm and anything we use that isn’t grown here is donated by other farmers and producers making everything farm to fork. All of the proceeds from the first dinner last fall were donated to Edible Sacramento High, an urban farm on the campus at Sacramento High School. The proceeds for the next dinner this spring will go to the Food Literacy Center of Sacramento. Kyle: Growing up I was always really interested in plants and watching them grow with my mom in the garden. I’ve always had an interest in plants and over the years I think my interest has evolved and along with my other passion for cooking, both evolved together. When I was eighteen I planted my first couple of tomato plants and each year it seems like my vegetable garden would grow larger and larger until I moved here where I have a very large empty back yard and was able to create my urban farm. Also just last year the city of Sacramento passed the urban faming ordinance. Where people can sell the produce they grow on their property but we just decided to give it away for free to help the sense of community and because we really enjoy doing it. Kyle: I spend a lot of my time outside, hiking or camping or fishing. I also enjoy biking, snowboarding and skateboarding. And I do a lot of photography with antique cameras that I restore from estate sales. I pretty much just enjoy doing anything fun and I’m always up for new adventures. Kyle: I’d say take pride in what you grow and make it your own. Don’t choose a crop or a variety of tomato just because you know it’s going to be easy to grow or has large yields or a long shelf life. Choose a variety that people are going to taste and say wow and want more. Choose something that you can grow that is going to make you proud, something you can grow and be proud of. The reward is the joy of actually doing it and watching it grow. If you can enjoy that then you can be a farmer because that is what it’s about.